This is an updated version of what was posted on Feb 1, 2015. The original information was accurate but some of the steps were optional and this is clearly indicated in the update. 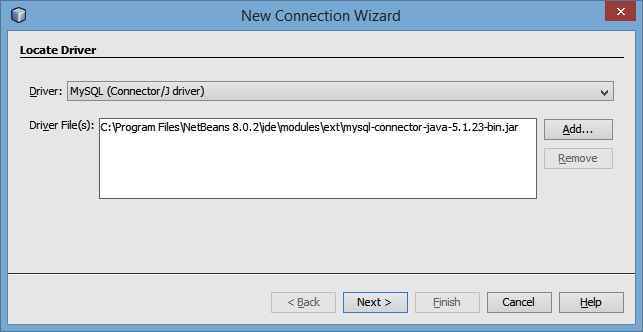 This tutorial assumes that you have installed the Java EE version of NetBeans 8.02. 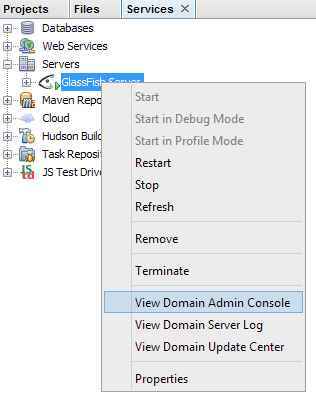 If you are using Windows then it is further assumed that you have replaced the default GlassFish server instance in NetBeans with a new instance with its own folder for the domain. See my previous article “Creating a New Instance of GlassFish in NetBeans IDE” On an Apple Mac and likely on Linux it is not necessary to do this. Before we even start NetBeans we must do a bit of preliminary work. With the exception of Derby, GlassFish does not include the MySQL driver or any other driver in its distribution. Go to the MySql Connector/J download site at http://dev.mysql.com/downloads/connector/j/ and download the latest version. I recommend downloading the Platform Independent version. If your OS is Windows download the ZIP archive otherwise download the TAR archive. You are looking for the driver file named mysql-connector-java-5.1.34-bin.jar in the archive. Copy the driver file to the lib folder in the directory where you placed your domain. On my system the folder is located at C:\Users\Ken\personal_domain\lib. If GlassFish is already running then you will have to restart it so that it picks up the new library. NetBeans has a feature that deploys the database driver to the domain’s lib folder if that driver is in NetBeans’ folder of drivers. On my Windows 8.1 system the MySQL driver can be found in C:\Program Files\NetBeans 8.0.2\ide\modules\ext. 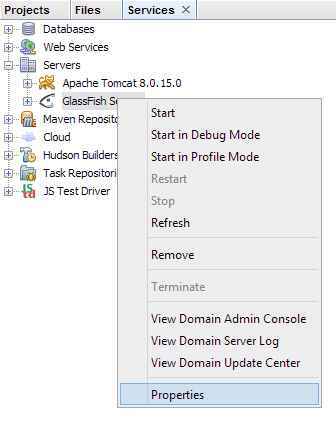 Start NetBeans and go to the Services tab, expand Servers and right mouse click on your GlassFish Server. Click on Properties and the Servers dialog will appear. 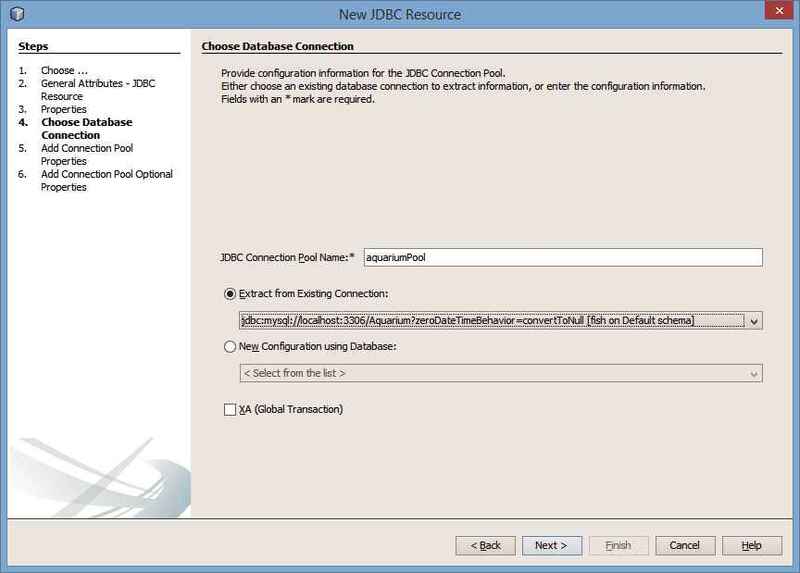 On this dialog you will see a check box labelled Enable JDBC Driver Deployment. By default it is checked. 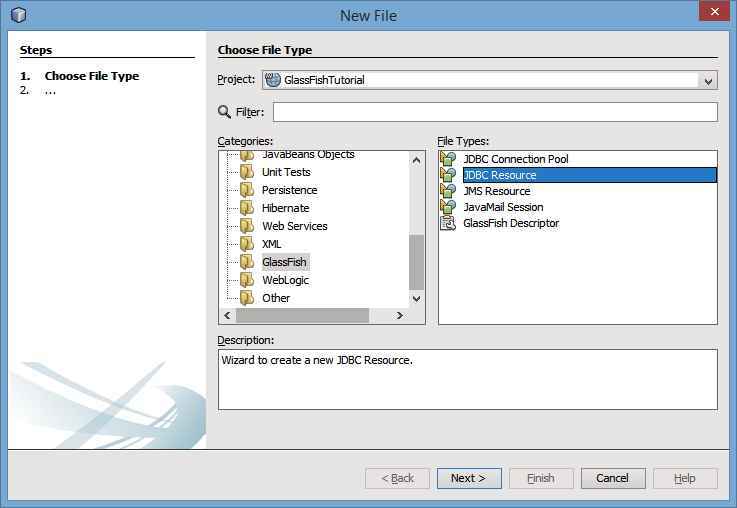 NetBeans determines the driver to copy to GlassFish from the file glassfish-resources.xml that we will create in Step 4 of this tutorial. Without this file and if you have not copied the driver into GlassFish manually then GlassFish will not be able to connect to the database. Any code in your web application will not work and all you will likely see are blank pages. Step 1a or Step 1b? I recommend Step 1a and manually add the driver. The reason I prefer this approach is that I can be certain that the most recent driver is in use. As of this writing NetBeans contains version 5.1.23 of the connector but the current version is 5.1.34. If you copy a driver into the lib folder then NetBeans will not replace it with an older driver even if the check box on the Server dialog is checked. NetBeans does not replace a driver if one is already in place. If you need a driver that NetBeans does have a copy of then Step 1b is your only choice. One feature I have always liked in NetBeans is that it has an interface for working with databases. All that is required is that you create a connection to the database. It also has additional features for managing a MySQL server but we won’t need those. If you have not already started your MySQL DBMS then do that now. I assume that the database you wish to connect to already exists. Go to the Services tab and right mouse click on New Connection. In the next dialog you must choose the database driver you wish to use. It defaults to Java DB (Embedded). 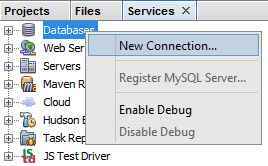 Pull down the combo box labeled Driver: and select MySQL (Connector/J driver). Click on Next and you will now see the Customize Connection dialog. Here you can enter the details of the connection. On my system the server is localhost and the database name is Aquarium. Here is what my dialog looks like. Notice the Test Connection button. I have clicked on mine and so I have the message Connection Succeeded. Click on Next. There is nothing to do on this dialog so click on Next. 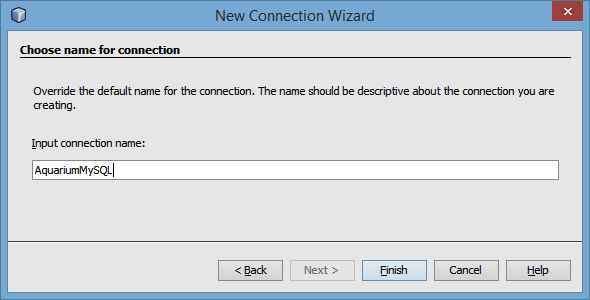 On this last dialog you have the option of assigning a name to the connection. By default it uses the URL but I prefer a more meaningful name. I have used AquariumMySQL. Click on Finish and the connection will appear under Databases. 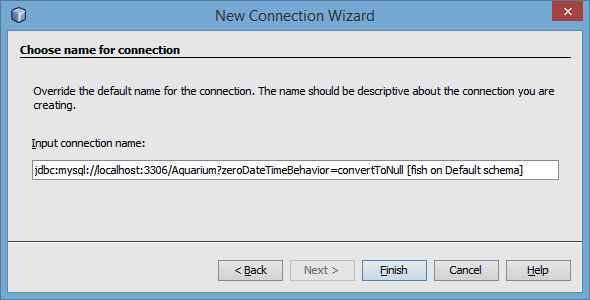 If the icon next to AquariumMySQL has what looks like a crack in it similar to the jdbc:derby connection then this means that a connection to the database could not be made. Verify that the database is running and is accessible. If it is then delete the connection and start over. Having a connection to the database in NetBeans is invaluable. You can interact with the database directly and issue SQL commands. As a MySQL user this means that I do not need to run the MySQL command line program to interact with the database. If you have not already done so create a New Project in NetBeans. I require my students to create a New Project in the Maven category of a Web Application project. Click on Next. 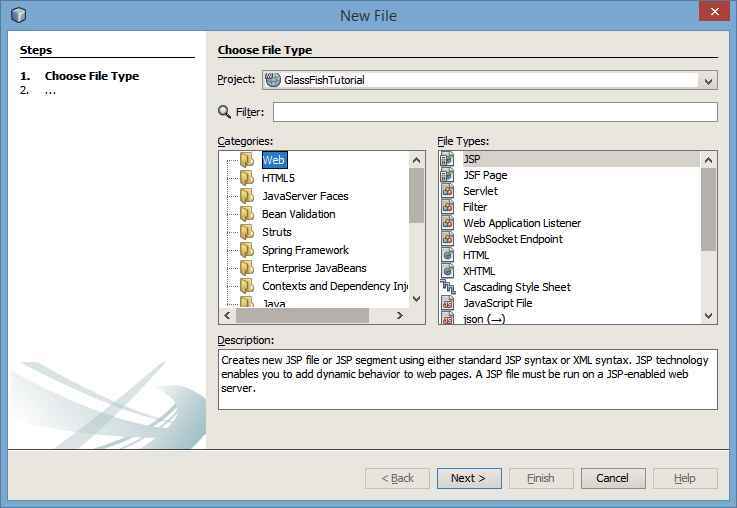 In this dialog you can give the project a name and a location in your file system. The Artifact Id, Group Id and Version are used by Maven. The final dialog lets you select the application server that your application will use and the version of Java EE that your code must be compliant with. Here is my project ready for the next step. 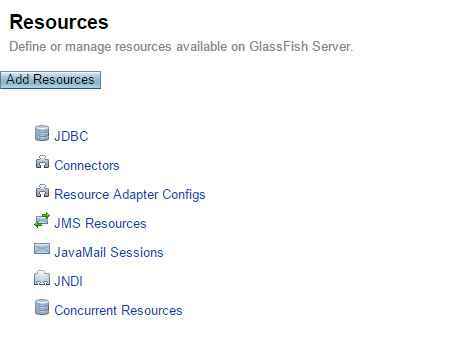 For GlassFish to manage your database connection you need to set up two resources, a JDBC Connection Pool and a JDBC Resource. 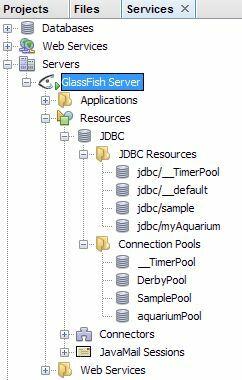 You can create both in one step by creating a GlassFish JDBC Resource because you can create the Connection Pool as part of the same operation. Scroll down the Categories list and select GlassFish. 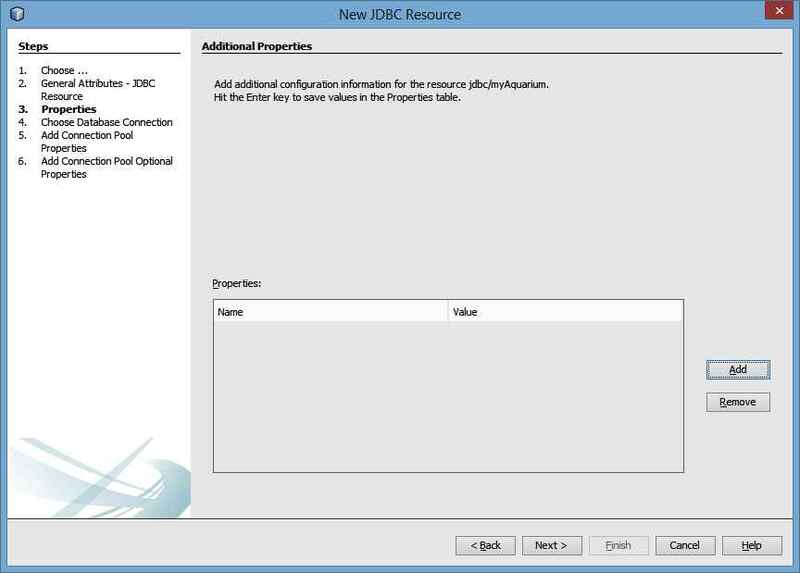 In the File Types list select JDBC Resource. Click on Next. The next dialog is the General Attributes. 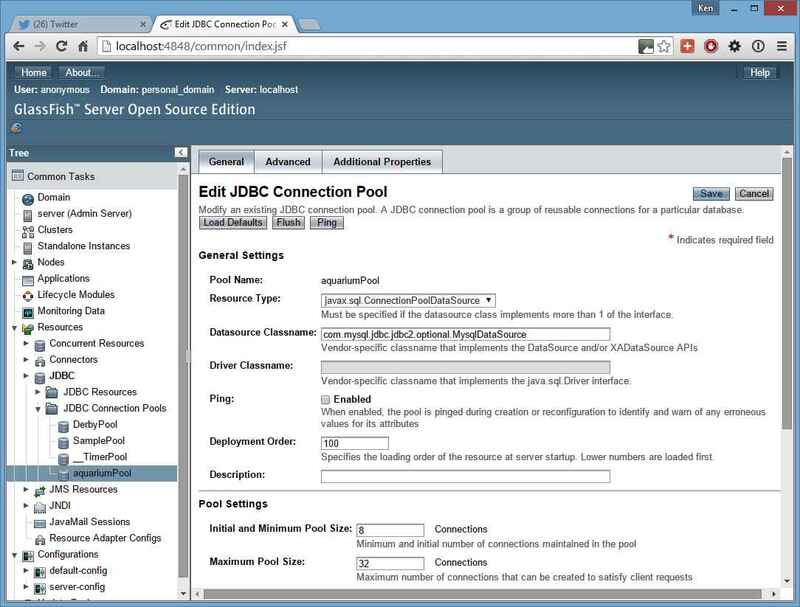 Click on the radio button for Create New JDBC Connection Pool. In the text field JNDI Name enter a name that is unique for the project. 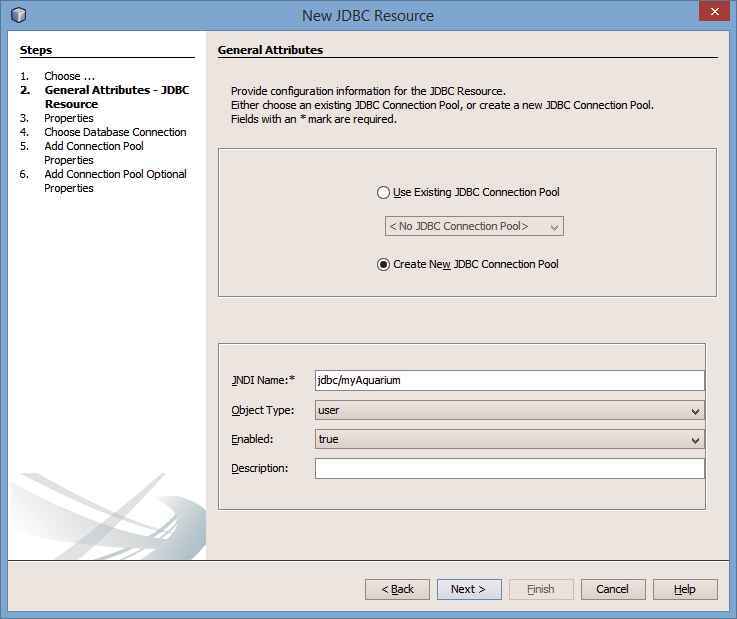 JNDI names for connection resources always begin with jdbc/ followed by a name that starts with a lower case letter. 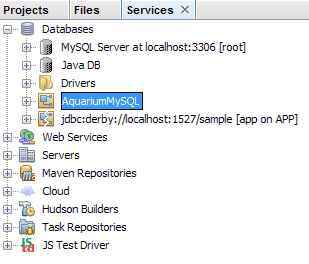 I have used jdbc/myAquarium. Do not prefix the name with java:app/ as some tutorials suggest. An upcoming article will explain why. Click on Next. There is nothing for us to enter on the Properties dialog. Click on Next. 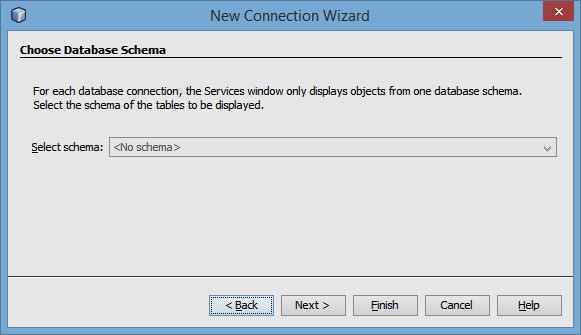 On the Choose Database Connection dialog we will give our connection pool a name and select the database connection we created in Step 2. Notice that in the list of available connections you are shown the connection URL and not the name you assigned to it back in Step 2. Click on Next. 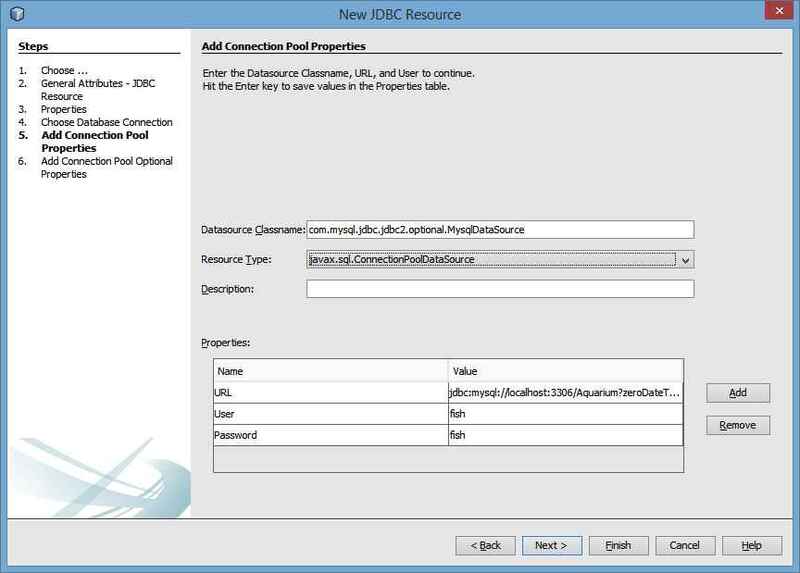 On the Add Connection Pool Properties dialog you will see the connection URL and the user name and password. We do need to make one change. The resource type shows javax.sql.DataSource and we must change it to javax.sql.ConnectionPoolDataSource. Click on Next. There is nothing we need to change on Add Connection Pool Optional Properties so click on Finish. A new folder has appeared in the Projects view named Other Sources. It contains a sub folder named setup. In this folder is the file glassfish-resources.xml. The glassfish-resources.xml file will contain the following. I have reformatted the file for easier viewing. 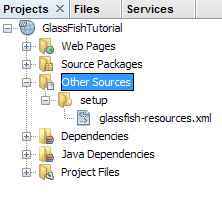 The glassfish-resources.xml file, when included in the application’s WAR file in the WEB-INF folder, can configure the resource and pool for the application when it is deployed in GlassFish. When the application is un-deployed the resource and pool are removed. 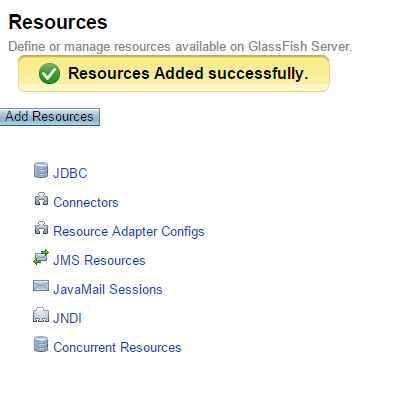 If you want to set up the resource and pool permanently in GlassFish then follow these steps. 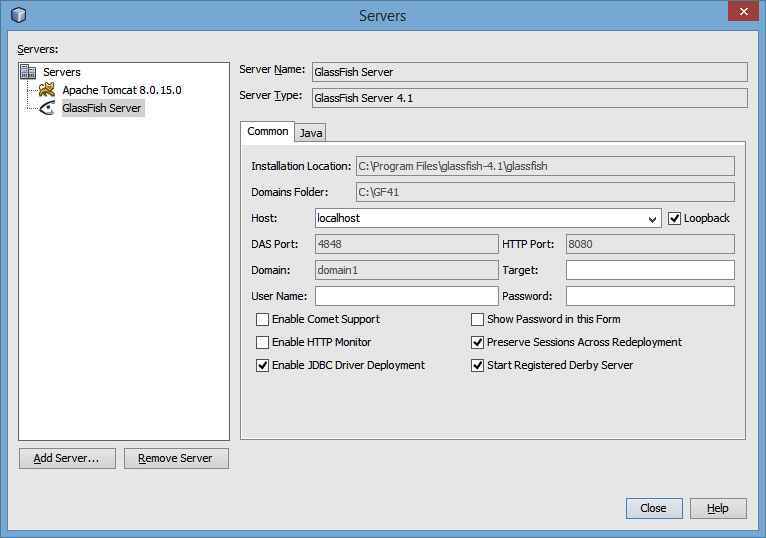 Go to the Services tab and select Servers and then right mouse click on GlassFish. 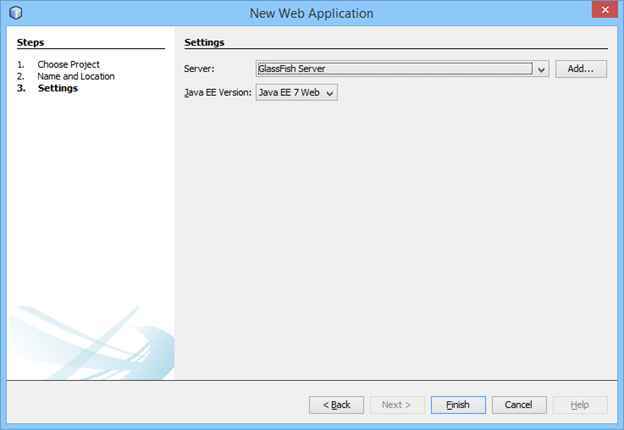 If GlassFish is not running then click on Start. With the server started click on View Domain Admin Console. 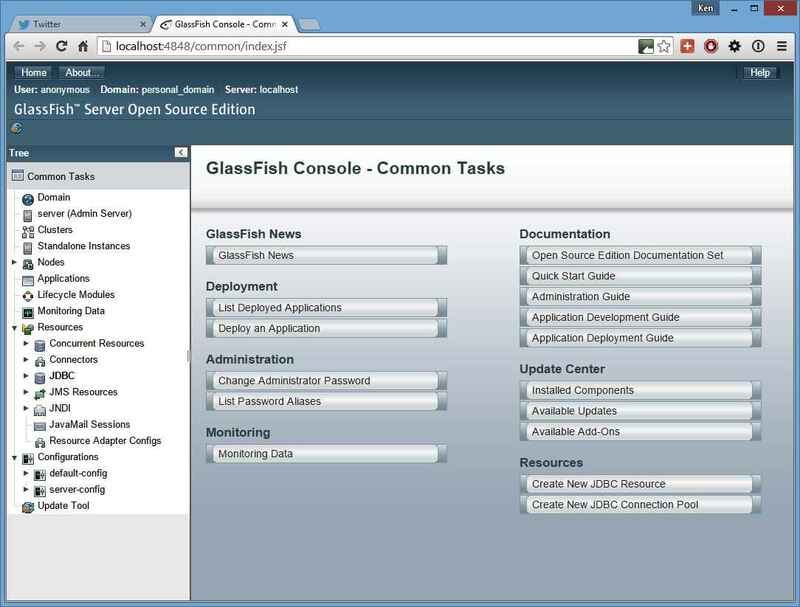 Your web browser will now open and show you the GlassFish console. If you assigned a user name and password to the server you will have to enter this information before you see the console. The final task in this step is to test if the connection works. 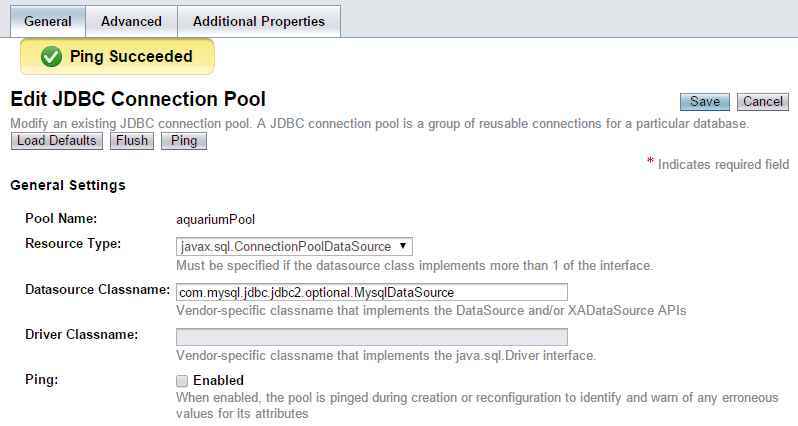 In the Common Tasks tree select Resources, JDBC, JDBC Connection Pools and aquariumPool. The most common reason for the Ping to fail is that the database driver is not in the domain’s lib folder. Go to Step 1a and manually add the driver. The resources are now visible in NetBeans. 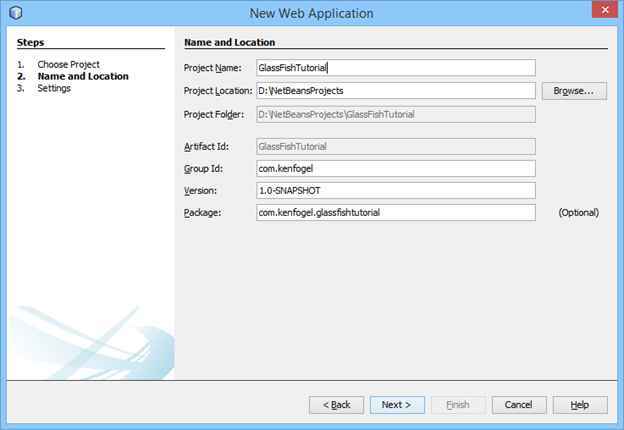 Having the resource and pool add to GlassFish permanently will allow other applications to share this same resource and pool. You are now ready to code! 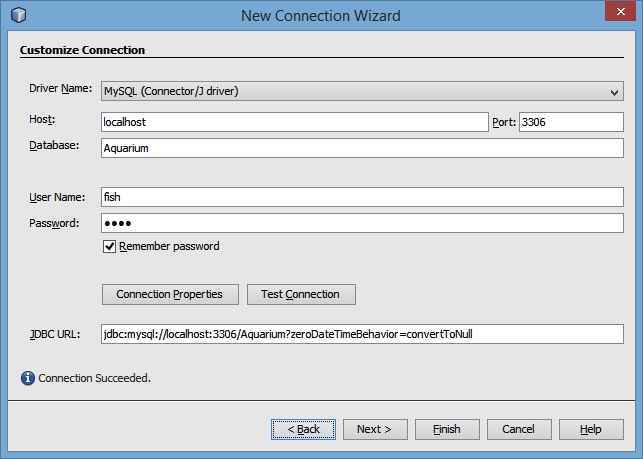 In the the article “Creating a New Instance of GlassFish in NetBeans” you have downloaded a newer mysql driver (mysql-connector-java-5.1.34-bin.jar). 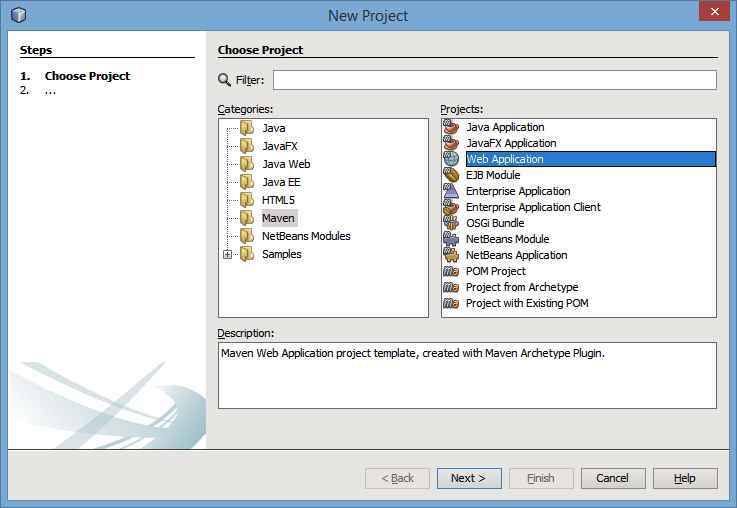 In this article you are still using the older (5.1.23) that comes bundled with NetBeans. Is there are reason for that (second screenshot in step 2)? I have copied the new driver 5.1.34 to the default NetBeans location (C:\Program Files\NetBeans 8.0.2\ide\modules\ext) and using it instead. This is a matter of preference. Do you update NetBeans to deploy the latest version or do you place the latest version in the domain’s lib folder. Your approach and mine are just as valid in the development environment. In the production environment where your application is being deployed as a war and not with NetBeans then you expect the driver to be on the server. mike Thank you, and I should point out a small aditaiondl note. In the database.yml file, the database is not sqlite3 , but jdbcsqlite3 Although that might have been apparent to others, I am new to netbeans, and have used sqlite3 with no development environment. I also am used to using regular ruby not jruby. I cant thank you enough!! you saved me from over one month of frustration trying to establish connection pool to no avail. I have already given up on trying many solutions until I meet your post. thanks again. Thank you very much Mr Ken for this article. It has personnally helped me a lot. But when I clicked on Ping for the first time it failed with an error message indicating that the access was denied. I clicked on the Additionnal Properties then I typed my password. When I pinged for the second time it succeeded. I followed this tutorial https://netbeans.org/kb/docs/web/mysql-webapp.html though very detailed it did not work. Some stages I found in your article are missing. If it was possible to make such an article with a complete simple web application it would be very very good for beginners like us. Thank you once more. What are the steps to configure multiple data sources? My application requires three databases from two different servers (the reason is some of the data must be kept extremely secure). Thank you! This really helped!